• Stories from Walt’s Office: Walt & Flight – “Think of the happiest things, it’s the same as having wings”. One thing you’ll notice inside Walt Disney’s office are all of the models and pictures of airplanes. Walt loved planes and was an aficionado of flying. As a continuation of the “Stories from Walt’s Office” series, we’ll soar into the world of one of Walt’s favorite pastimes and look at the history behind the company airplane he used to scout Central Florida looking for the perfect place to build his second theme park. • A “Darling” Conversation with Wendy & John: Kathryn Beaumont and Paul Collins – Join Disney Legend Kathryn Beaumont (the voice of Wendy) and Paul Collins (the voice of John) as they reunite for the first time in many years to reminisce and discuss their experiences working on Peter Pan, meeting Walt Disney and learning to fly … literally. • You Can Fly” – A new “Oke” rendition and graphic look of the classic Disney song, “You Can Fly,” with fun lyrics on screen and lots of your favorite “Peter Pan” characters. • “Never Smile at a Crocodile” – A new “Oke” rendition and graphic look of the deleted song, “Never Smile at a Crocodile”, with fun lyrics on screen and highlighting the relationship between Captain Hook and Tick- Tock the Crocodile. • Sing-along Version of the film: Sing along with your favorite songs from the movie. • Growing Up with Nine Old Men – “Peter Pan” is both a story of living with a child’s sense of openness to the world and an acknowledgement that the path to adulthood most often leads away from those qualities. A parallel of sorts to that duality can be found in Walt Disney and his core group of animators, the Nine Old Men, in their lives and in their work. Our short film will look at who they were and the parts they played in one of the most remarkable team of artists that ever worked together. • Deleted Song: “The Pirate’s Song” – Original demo recording of the song played over concept art. • Deleted Song: “Never Smile at a Crocodile” – With music played over static concept art of the crocodile from Pater Pan. • Deleted Song: “The Boatswain Song” – With music played over static concept art of Captain Hook and his crew. • Deleted Scene: “The Journey Home” – A proposed alternate ending where Peter asks the Lost Boys to return home with Wendy and the other children. • Deleted Scene: “Alternate Arrival” – A deleted scene where Wendy and the children are initially attacked by the Lost Boys because Tinker Bell tells them that Wendy is holding Peter captive. We also see in this version of the story that Nana the dog travels to Never Land with Wendy and the children. • Disney Song Select – Simply play the clip from the movie with subtitles underneath it. • Audio Commentary Hosted by Roy Disney – Audio commentary hosted by Roy Disney, but carried on by several other people. o ”Never Land”: The Lost Song – A bonus piece that sets up the backstory of where this lost song was found and how Richard Sherman recomposed it. o Music Video: “The Second Star to the Right” – Music Performed by T-Squad – A music video of the song “The Second Star to the Right” performed by T-Squad. 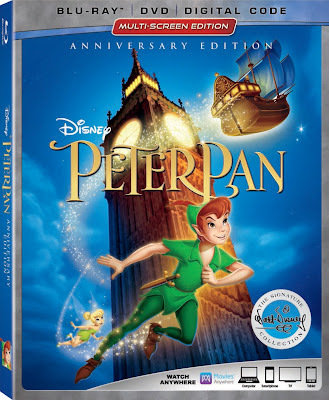 o In Walt’s Words: “Why I Made ‘Peter Pan’” – Based upon an article written by Walt Disney retold as a dramatic recreation. o The Peter Pan That Almost Was – Hosted by Ron Clements and John Musker, we take a look at the storyboards and early concepts of a version of the “Peter Pan” film that never saw the light of day. 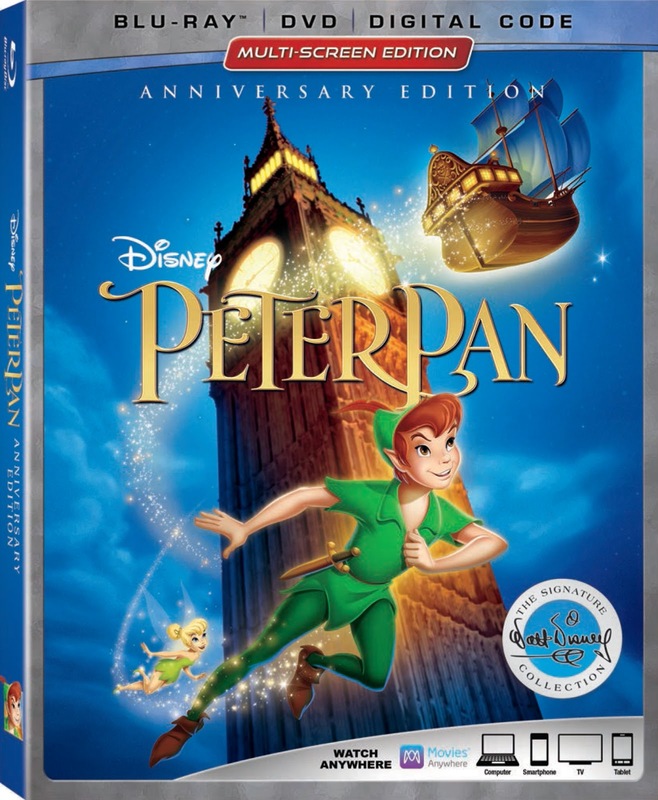 o The “Peter Pan” Story – An original featurette for the film created in 1952.